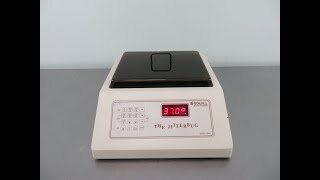 The Boekel Scientific Jitterbug 130000 Heated Microplate Shaker provides consistent heating and shaking of microplates in an easy to use, low profile lab instrument. This microplate shaker accommodates up to 2 standard microplates, (96, 384, and 536) or strip trays. The chamber of this heated microplate shaker reaches up to 40° C and has 8 shaking speeds between 575 to 1500 RPM, with a pulse function at 1500 RPM for 3 seconds. Parameters for this microplate shaker can be set independently across temperature, speed and duration, up to 99 min. 59 sec. This quiet operating plate shaker has excellent temperature uniformity, and an inner lid to help retain heat and reduce contamination. 1 second to 99 min. 59 sec. 11 x 12 x 5"
This Boekel Jitterbug Heated Plate Shaker Model 130000 has been fully inspected and is operating without issue. Please note there is a slight blemish in the top however it is cosmetic and does not impact performance. All of our lab equipment comes backed with our standard warranty. Should you have any questions, please don't hesitate to contact us.